Picture - The B-20 afloat. Note the notch in the lower fuselage where the main float retracted. A notch can also be seen in the end of the wing, where the support for the wing float lay when it folded outward. The Blackburn B-20 was an experimental aircraft, first flying in 1940, that attempted to drastically increase the performance of flying boat designs. 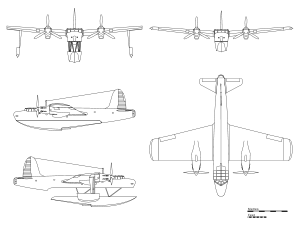 Blackburn Aircraft undertook an independent design study based on a patent filed by their chief designer, J. D. Rennie. The B-20 was an attempt to combine the best features of both the flying boat and the floatplane. While on the water, the B-20 was essentially a floatplane, using a large float under the fuselage for buoyancy, and two smaller floats near the wing tips for stability. In flight, the main float retracted towards the fuselage, fitting into a "notch" to become streamlined as a part of the fuselage. The wing floats folded outward to become the wing tips. Blackburn along with Supermarine and Saunders-Roe tendered craft for Air Ministry Specification R1/36. What would enter service as the Saunders Roe Lerwick was the chosen aircraft but the Ministry was interested enough to authorise prototype of the B-20, serial number V8914. The prototype would fly for the first time on March 26, 1940. 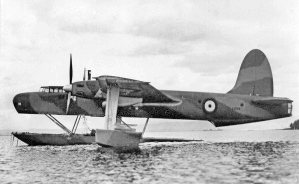 On 7 April, during a test run, the aircraft experienced extreme vibration due to aileron flutter and the crew bailed out, three were lost the other two were picked up by HMS Transylvania, a converted merchantman. Development ceased when the first prototype crashed, as Blackburn's resources were dedicated to the war effort. The aircraft's wreck still exists, but is remains undisturbed as it is designated a War grave. In 1998, one of the engines was raised as it had been caught in a fishing boat's nets and dragged away from the wreck, into shallower water. It is currently an exhibit in the Dumfries and Galloway Aviation Museum. "Blackburn B-20". British Aircraft Directory. 2003-07-20. http://www.britishaircraft.co.uk/aircraftpage.php?ID=304. Retrieved 2006-08-19. Blackburn B-20 Pictures and Blackburn B-20 for Sale.